I can hardly believe it’s almost December… it will be on Saturday. The year is almost over and the produce is almost gone. We have three more weeks at the firehouse and still have a few thing available, cabbage, onions, white potatoes, sweet potatoes, fall/winter squashes… acorn, buttercup, carnival and butternut. Sad to say our tomatoes are gone for the season, but our fresh baby lettuce will be cut and ready this weekend. Plenty of greens too; Swiss chard, kale and spinach as well as some, mustard greens, turnips with tops and fresh radishes. With such short hours at the market on Saturdays, only 10-noon, we will not be bringing as many greens as in the past. 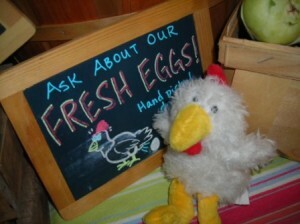 We have been taking home way too much produce, the chickens love us but it’s too much work for Kenny. Please be sure and e-mail your orders by early Friday morning and we will have them ready when you arrive. We still will have Mistletoe. Kenny and his buddy Lee harvested some for the holidays, pick some up for your holiday decorations.